Struggle For Smarts? How Eastern And Western Cultures Tackle Learning : Shots - Health News For the most part in American culture, intellectual struggle in school children is seen as an indicator of weakness, while in Eastern cultures it is not only tolerated, it is often used to measure emotional strength. Chinese schoolchildren during lessons at a classroom in Hefei, east China's Anhui province, in 2010. "The teacher was trying to teach the class how to draw three-dimensional cubes on paper," Stigler explains, "and one kid was just totally having trouble with it. His cube looked all cockeyed, so the teacher said to him, 'Why don't you go put yours on the board?' So right there I thought, 'That's interesting! He took the one who can't do it and told him to go and put it on the board.' "
Stigler knew that in American classrooms, it was usually the best kid in the class who was invited to the board. And so he watched with interest as the Japanese student dutifully came to the board and started drawing, but still couldn't complete the cube. Every few minutes, the teacher would ask the rest of the class whether the kid had gotten it right, and the class would look up from their work, and shake their heads no. And as the period progressed, Stigler noticed that he — Stigler — was getting more and more anxious. "I realized that I was sitting there starting to perspire," he says, "because I was really empathizing with this kid. I thought, 'This kid is going to break into tears!' "
But the kid didn't break into tears. Stigler says the child continued to draw his cube with equanimity. "And at the end of the class, he did make his cube look right! And the teacher said to the class, 'How does that look, class?' And they all looked up and said, 'He did it!' And they broke into applause." The kid smiled a huge smile and sat down, clearly proud of himself. In Eastern cultures, Stigler says, it's just assumed that struggle is a predictable part of the learning process. Everyone is expected to struggle in the process of learning, and so struggling becomes a chance to show that you, the student, have what it takes emotionally to resolve the problem by persisting through that struggle. "They've taught them that suffering can be a good thing," Stigler says. "I mean it sounds bad, but I think that's what they've taught them." Granting that there is a lot of cultural diversity within East and West and it's possible to point to counterexamples in each, Stigler still sums up the difference this way: For the most part in American culture, intellectual struggle in schoolchildren is seen as an indicator of weakness, while in Eastern cultures it is not only tolerated but is often used to measure emotional strength. It's a small difference in approach that Stigler believes has some very big implications. 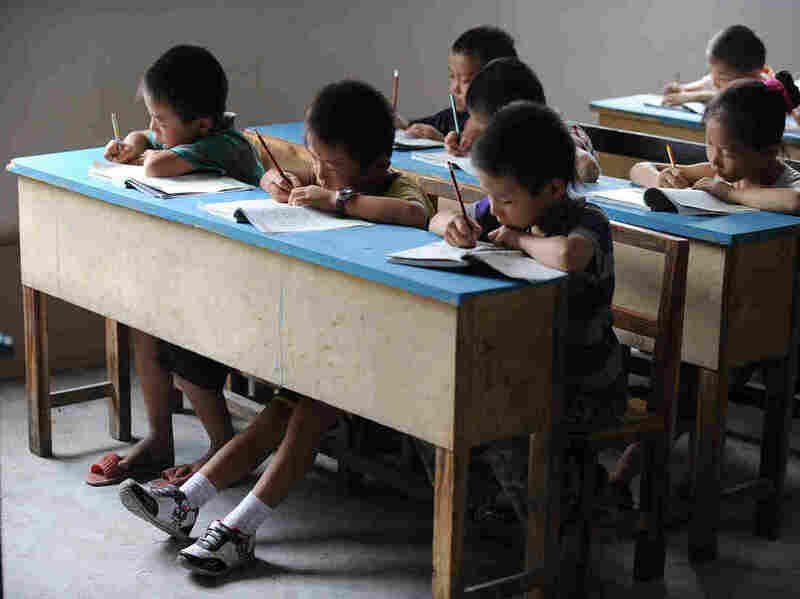 Jin Li is a professor at Brown University who, like Stigler, compares the learning beliefs of Asian and U.S. children. She says that to understand why these two cultures view struggle so differently, it's good to step back and examine how they think about where academic excellence comes from. Mother: Do you know that's what smart people do, smart grown-ups? Child: I know ... talk about books. Mother: Yeah. So that's a pretty smart thing to do to talk about a book. It's a small exchange — a moment. But Li says, this drop of conversation contains a world of cultural assumptions and beliefs. Essentially, the American mother is communicating to her son that the cause of his success in school is his intelligence. He's smart — which, Li says, is a common American view. "The idea of intelligence is believed in the West as a cause," Li explains. "She is telling him that there is something in him, in his mind, that enables him to do what he does." But in many Asian cultures, Li says, academic excellence isn't linked with intelligence in the same way. "It resides in what they do, but not who they are, what they're born with," she says. "You practiced and practiced with lots of energy," she tells him. "It got really hard, but you made a great effort. You insisted on practicing yourself." "So the focus is on the process of persisting through it despite the challenges, not giving up, and that's what leads to success," Li says. Obviously if struggle indicates weakness — a lack of intelligence — it makes you feel bad, and so you're less likely to put up with it. But if struggle indicates strength — an ability to face down the challenges that inevitably occur when you are trying to learn something — you're more willing to accept it. "We did a study many years ago with first-grade students," he tells me. "We decided to go out and give the students an impossible math problem to work on, and then we would measure how long they worked on it before they gave up." The American students "worked on it less than 30 seconds on average and then they basically looked at us and said, 'We haven't had this,' " he says. But the Japanese students worked for the entire hour on the impossible problem. "And finally we had to stop the session because the hour was up. And then we had to debrief them and say, 'Oh, that was not a possible problem; that was an impossible problem!' and they looked at us like, 'What kind of animals are we?' " Stigler recalls. "Think about that [kind of behavior] spread over a lifetime," he says. "That's a big difference." This is not to imply that the Eastern way of interpreting struggle — or anything else — is better than the Western way, or vice versa. Each has its strengths and weaknesses, which both sides know. Westerns tend to worry that their kids won't be able to compete against Asian kids who excel in many areas but especially in math and science. Li says that educators from Asian countries have their own set of worries.
" 'Our children are not creative. Our children do not have individuality. They're just robots.' You hear the educators from Asian countries express that concern, a lot," she notes. Both Stigler and Li think that changing culture is hard, but that it's possible to think differently in ways that can help. "Could we change our views of learning and place more emphasis on struggle?" Stigler asks. "Yeah." For example, Stigler says, in the Japanese classrooms that he's studied, teachers consciously design tasks that are slightly beyond the capabilities of the students they teach, so the students can actually experience struggling with something just outside their reach. Then, once the task is mastered, the teachers actively point out that the student was able to accomplish it through hard work and struggle. "And I just think that especially in schools, we don't create enough of those experiences, and then we don't point them out clearly enough."